It may seem simple, but catching a fish can bring smiles that last a lifetime, especially for kids. That includes kids with special needs. 6 year old Paxton Matthews is like a lot of kids, but he's got some challenges to go with his passion, so his mother Christina contacted "Inclusioneers," engineers for inclusion. 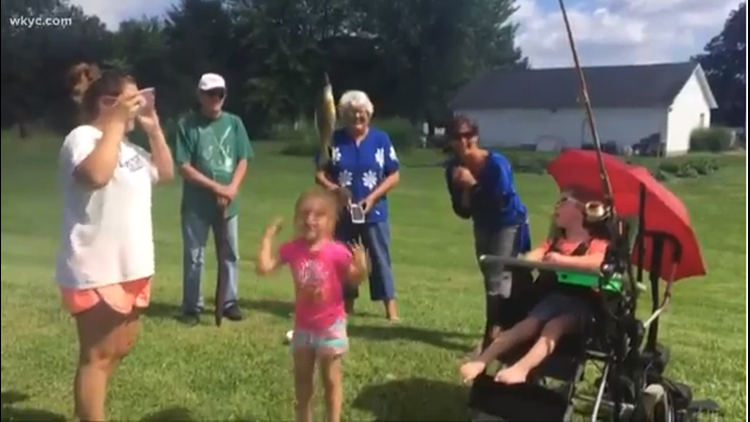 "She said he loved to fish but he hates it when we take the pole away and she asked us if we'd automate the reeling in of the fish," Mike Firtha, president of Inclusioneers, told us. Inclusioneers partnered with the Summit Sportsmans Association, Portage and Summit County DD Boards, and University of Akron to design the automated rod and reel. "I just want to see Paxton catch a fish and have fun, you know? Enjoy something any other regular boy could enjoy," said Walid Abuhashim, a student from the University of Akron. On it's first run, Paxton got to catch and reel in his own fish. Truly a life-changing moment for all. "There are literally about 15 people responsible for making that fishing reel come around, and when you see that happen, it's like it all comes together and says, 'Man, is it worth it, or what? '," Firtha says with a huge smile. "To see him able to do something on his own and interact with everybody in our family, it's just amazing. I can't even explain it," adds Paxton's mom Christina.